Find the best Cyprus hotels reviews to help you plan where to spend your next holiday in Cyprus. 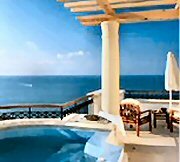 There are lots and lots of hotels in Cyprus, from basic no frills establishments like the Tasmaria Hotel Apts in Paphos to top 5 star luxury spa hotels like the gorgeous Anassa, one of the leading hotels of the world. But when it comes to choosing a Cyprus hotel, where on earth do you start? Even when you've narrowed down the location or town on the island, you still need a little help right? And that's where it pays to read comments and honest feedback from other people who have stayed at a hotel you may be considering for your next holiday. Reading about other travellers' experiences at a particular hotel helps to narrow down your search and in my view, the best place to find a Cyprus hotels review is at Tripadvisor. Not only will you find plenty of frank and honest feedback from real people who have stayed at these hotels, you'll also find tips on the best time to visit, the best places to eat nearby, a list of things to do in the local area and, most importantly, price comparisons to find the best deal on every hotel in Cyprus. Four Seasons Hotel near St Raphael marina in Limassol. Ayii Anargyri Natural Healing Spa at Miliou between Paphos and Polis. Almyra Hotel, sister hotel to the Anassa located on the beach in Paphos. Le Meridien Limassol Spa and Resort. Remember to check out as many reviews on the above links before you commit to any holiday plans. Plus feel free to leave your own hotel reviews at Tripadvisor to help other holidaymakers make the most of their next trip.